Enjoy the beautiful and varied landscape of the Gover Valley where china clay workings have once again been reclaimed by nature. Enjoy the charm of wooded valleys before entering a wide open space providing impressive views of the Cornish landscape. 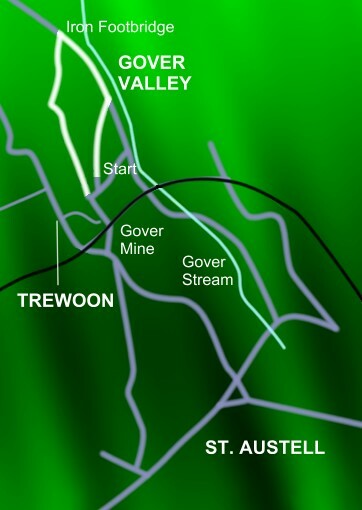 The word Gover translated means ‘stream’ and has gained its name from a tributary of the St Austell river which runs through it. It is known locally as ‘The White River’. Despite the fact that china clay workings are no longer active in the valley, the river and its pools still retain china clay’s recognisable milky residue and turquoise tint. There is also evidence of a small tin mine to the right of the valley not forgetting Brunel’s railway viaduct which services the Truro to Plymouth line. The walk begins and ends at the village of Trewoon on the A3058 west of St Austell taking no longer than an hour. Perfect for a light-hearted morning or afternoon activity.